Whether you love your cooking or eating out – whatever form your love of food takes, why not come along to Neven’s Food Festival and watch as Neven prepares a three course meal. Neven hosts a fantastic evening of food, chat and shares much of his expertise and passion for food with the audience. 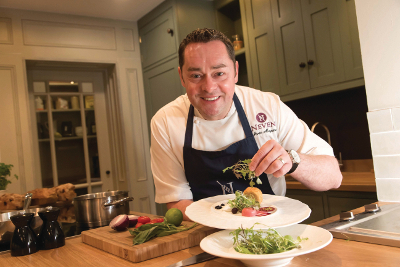 With support form his great team at MacNean House & Restaurant and the Neven Maguire Cookery School, Neven will not only demonstrate great dishes that you can make at home, but share his love of food and the importance of using Irish food and local and seasonal ingredients whenever we can. Its a great night out and it is made all the more special by the presence of the stall holders sharing their artisan foods and crafts, that make it all a very special night out. Many thanks to Dunnes Stores who are providing a glass of prosecco or wine on arrival. Remember you will be supporting our Target Lung Cancer campaign and we are delighted to have Neven as our Ambassador for Target Lung Cancer at St James’s Hospital. We are sure that it will be a very special night in a great venue! Target Lung Cancer appeal is to raise vital funding for lung cancer patient support and research at St. James’s Hospital.